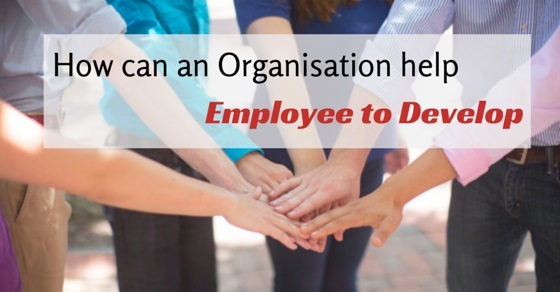 How Can an Organization Help in Developing Employees? The young employees of now are the potential industry leaders of tomorrow. It is one of the most important responsibilities of a manager and senior- to help the staff in their development. As seniors and present leaders, we have a responsibility to help our future by showing them the way, by training and mentoring them, by steering them to the right organization. Organizations that take advantage of the experience and seniority of their employees not only develop and retain the talent they have managed to attract and hire, but also help the employees at their personal level. It is also a way to keep the best young talent in our organization. By using an effective development program for their employees, the leaders of today can help widen the talent base and churn out tomorrow’s leaders. It can be done by giving them chances to hone their skills, increase their capacity, gather new information and give access to new resources so that they become successful in their career and job. Examples are – Providing on the job training, working in goal oriented manner, educating them and asking them their development goals and then helping them write their own Individual Development Program. The ways in which seniors can help a person in development are by encouraging them and helping to remove obstacles in the way of their development. A new employee is already anxious about his first day of job and the organization and the seniors should try to create a comfortable environment without overwhelming him/her with too much information. Orientation is a long process and the new employee should be given time to process the gathered information. The nervousness of the employee should be reduced and he should be introduced around. Also, the benefits to be provided should be explained to the employee as it is a positive point and should be known to the employee. An employee should be given the mission statements of the organization so that he/she can adjust according to them and prepare himself/herself for the coming work. It will reduce his future anxiousness and help him in coping with the coming stress. He will acquire the necessary skill to help him in the assignment given. It is very hard to be a mentor without being a leader. A leader is a person who shows the way for others, leads by example. A leader is a person who has a vision, mission and then motivates people around him to do things. They should know how and what to change as per the situation. Mentors and leaders share many qualities. The most important role of mentor is to inspire people and train them to achieve goals. The goals may differ but the means to achieve it is the same- guiding and training people. The employees should be trained as leader and encouraged to achieve their individual development goals also. A well drafted training program that increases learning during and after the job means the employees develop and also stay longer on the job. Methods may include orientation for new employees, on the job and classroom training for existing employees. Apart from office based training, internet training is also an increasingly effective way to help employees learn at their own pace and at their own convenience. They can learn at their home, at weekends and at evenings with access to internet and no stress of office hours. This method is a unique way of learning from classroom teaching wherein the employees are in control of their own learning. They can direct it at their own pace and style. It also allows more space for customized learning style and encourages them to take ownership of their own development process. If the employer wants to make sure that the employee doesn’t ignore it and takes it seriously, they can create an arrangement wherein both – the employer and employees sign learning contract or a personal development planned agreement wherein both have clear established goals and follow it with great care. Coaching is one of the oldest ways of developing people, be it any particular subject or about their overall growth. An effective program of coaching and mentoring depends on the coach and the employee. It depends on the skills, qualities, and the field of coaching. The time devoted to it also depends on this. Adequate time for mentoring sessions should be given with streamlined timeline and goal. There are many benefits of this approach and it includes improved quantity and quality of doing work, improved communication and skills of problem solving, transfer of learning from the senior to the employee. Promotion is something every employee wishes for. It might be in terms of greater responsibilities or in greater monetary remuneration. Both ways, it is essential and beneficial as well. The traditional way of promoting someone for good performance is to promote someone to a greater position of higher responsibility. It also resulted in retaining of the employee and developed employee skills. A true promotion takes place after careful assessment and implementation of many details such as bridging the gap in communication skills and providing them the necessary support through training and coaching employees. Job rotation means moving of the employee through different positions and it can be for any period of time. It could last a few months or a even a year or two. It helps the employee in learning a variety of skills that are needed for that particular job and it results in his development. Cross training is a unique way of training where the employee learns the skills that are needed for the job of a different position. Such type of approaches add diversity to a employee’s profile, it adds interest and at the same time prepares individuals for higher positions. At the same time, it rejuvenates them and improves their working style and communication skills. Job enrichment opposite to promotion as it means that the employee’s responsibility and authority is enriched within his current position. This approach might sound tiring as new responsibilities are added without any new position however; this is a very effective way for those who need motivation. This approach reignites the interest of the employee and encourages him to try new work and hence get a chance to acquire new skills, build new relationships and explore new areas of specialization. A few examples of job enrichment include special assignments and serving on teams that are cross functional. Job aids are tools that help the employees to perform their job in a better and improved way. It includes checklist, posters, tips, reminders, diagrams or flow charts. It is mainly used to help the employee remember and recall by providing important, accessible facts within reach in short time. To be actually supportive, the job aid should be to the point. It should be concise, specific and written in simple language. After all it is supposed to help the employee and not to confuse him. Also, the aid should be easily interpretable. Lateral movement means moving of employee to a position which is similar to his existing position with the same status, responsibility and pay. It offers a new inflow of challenges and encourages the development of employees without increasing the responsibility. It increases the flexibility of the employees and makes them adaptable. It also facilitates better communication among different departments and in small businesses which have limited scope for advancement; this is the perfect way to retain employees who might leave due to monotony in work. Benefits of Skill Development of employees are innumerable. However, some of the measurable ones are increased margins, better productivity, increased customer satisfaction and fewer mistakes. It gives the business a stronger sales performance edge too as happy employees work well and improves the sale or turnover of business. It also results in improved morale of the employees and reduced recruitment costs as fewer employees will leave. The business gives them the ability to grow and it also helps in growth of the business. Some managers may think that the cost of organizing such training programs, mentoring sessions may result in huge dent to the organization’s profit but it is overall profitable. Apart from above mentioned benefits, it also saves the recruitment, hiring and training cost of new employees. The overall labour force is reducing due to many reasons such as aging labour force, declining birth rate and early retirement. In such cases it becomes all the more important to retain the existing workforce. An investment in staff development and training will help alleviate such shortages and give greater value to the organization. Previous articleHow to Optimize your LinkedIn Profile for Job Search?